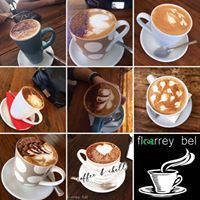 Im a Fan of Florrey Bel Coffee Shed... Are you? Fill in the below form and you can recommend ‘Florrey Bel Coffee Shed’ to a friend or family member via a text message. Show your support with a quick share of ‘Florrey Bel Coffee Shed’. Best coffee, great food and fantastic staff. Great team, very friendly, best coffee around! This local cafe just has the best food and also the best service around . Never have I had better food , it’s alway fresh , tasty and served with a smile . Beautiful food, great service & very friendly staff, would highly recommend Dlorrey Bel. We took some relatives there & they were just so happy with everything. Fantastic staff, fantastic food, all at a great price. Whenever I visit Florrey Bel, my cup of tea, just the way I like it, is on the table almost before I have sat down. Friendly staff, good food and welcoming atmosphere. Food is amazingly delicious, the staff are attentive, the portions are excellent, the owners are wonderful! Always great food and great coffee! Love florrey bell coffee shop!!! Joe and the staff are amazing! We bring our kids and nothing is ever a problem for them!!! The food is great and always brought out fast!! Love this coffee shop!! !